This bench is for my grandfather whom I share a shop with. We built it together, him doing most of the work on the top, I built the base. As you can see the design changed quite a bit since the original drawing. I will add a bit more to the description later in the day but I wanted to get this posted for now. Ryan, pretty cool working with your grandfather. I am the old one in our family and looking forward to maybe working with my grandkids. One question, the gap between the top and base? I see a long ( front to back) tenon. Possibly a sliding dovetail in the future? A nice build. What a gift, being able to do woodworking with your grandfather. Kevin, if you look at the pic with the base only you can get an idea of what this is for. I left the top of the support rail exposed in a way that wood movement will not introduce end grain into the equation…this means permanent rock solid support for the top. 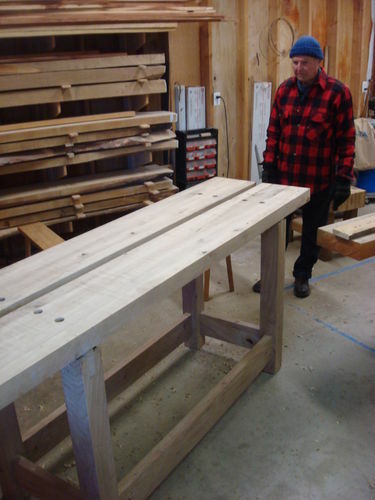 I got the idea for Ian Kirby’s bench in The Workbench Book (Tolphin). 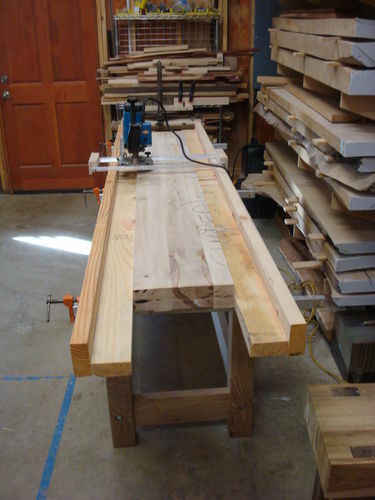 I kept all the joinery VERY simple on this bench, I wanted it to be easy but tough as nails. So I through bolted the top to the base. I forgot that this bench knocks down to 8 very easily carried parts (2 top pieces, 2 end assemblies, 2 stretchers, 1 center divider flip stop, 1 shelf). Nice build both of you. well done. I see how the top is fastened in the drawing, but the drawing doesn’t include the front to back stretchers. How are you fastening the top? That is some good stuff Ryan. The design changed quite a bit over time. Does your Grampa wear the same shirt and hat every day? Flatus- let’s see if you can get your G-kids to build you a bench! Scotty i would be deeply honored if that happened. Seeing Ryan and his grandad really is amazing. wish I cooud have done that with my grandfathers . Scotty, it was the same pic from when I shared this on the smackdown thread a few months ago. Don, the original concept had a thicker top than what Gramps ended up with (large scale projects are not his forte…but he has done some unbelievable intarsia). So the base got redesigned from the original, which just sat on the four legs and was held with 4 L brackets. I decided when I saw the thinner top to move the stretcher up and beef it up quite a bit. Gramps also ended up with a narrower top than he should have, which had a bit too much twist when he glued it up, so that gave us the opportunity to do a split top. Even the halves had to be re-flattened and had more stock in them than I felt taking off by hand. It’s the only time I felt like this was a good idea. This will be a wonderful addition to your shop. You both did a fine job on it. Wonderful bench you guys made. May it serve you for many years to come. Nice build. Looks very stout. Ryan, are those bolts holes on the top? ^Yep. I wanted the whole mess to break down but to be very stout. In case you are curious, I forced all wood movement to the center by keeping the tolerances on the outside bolts tight and drilling 3/16” oversized holes in the stretcher on the interior bolts. 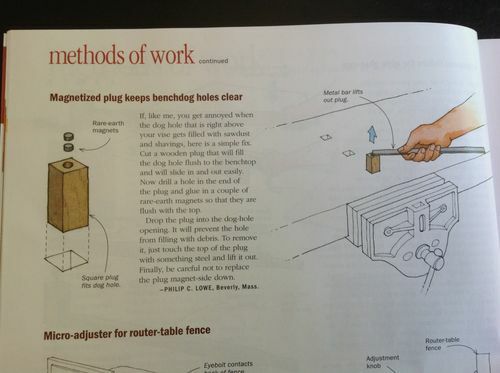 The reason I ask is because it reminded of a “tip” in this months issue of Fine Woodworking by Phil Lowe.The tip explains how he “plugs” his dog holes to keep debris out. He cuts a plug that slides down into the hole. At the top of the plug he glues in rare earth magnets. When wants to remove the plug he just touches it with a screw driver and the plug comes out. I thought this tip may serve you.